Cat® industrial engines are ready for your application. These engines deliver the unsurpassed reliability, durability, fuel efficiency, and low cost of ownership you have come to expect from Caterpillar. And our world-class product support will never let you down. All this adds up to a powerful advantage for you. Cat® Tier 4 Interim/Stage IIB technology engines available – These engines meet tough emissions standards and deliver the performance and efficiency you expect from Caterpillar. We offer services for a variety of Cat Industrial Engines ranging from 13 bhp to 2000 bhp for many different applications in the Industrial Engine Market. Our capabilities for our Original Equipment Manufacturers (OEM) exceed our customers expectations of engine related parts and repairs. 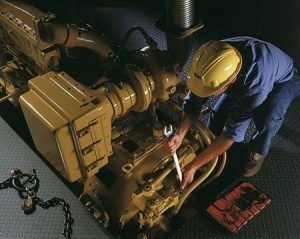 Whether it’s a simple repair or a major overhaul, our customers rely on our Industrial Engine Service Department to keep their equipment operating at all times. Our highly trained technicians are experienced and able to accurately diagnose problems to keep engines on the job and running at peak performance. Fire pump diesel engines must work when called upon. Our service technicians are well trained on inspection procedures and know what to look for to keep you informed. Our PM procedures are thorough and complete. We strive to take the guess work out of the maintenance and repairs to enhance your operating time. Our service team provides regularly scheduled oil sampling, and trending analysis to avoid unnecessary down time.